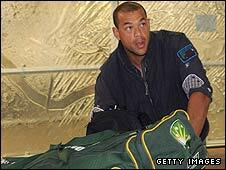 Australia have withdrawn a central contract offer to Andrew Symonds after he was sent home from the Twenty20 World Cup for disciplinary reasons. The 34-year-old has been been replaced in the list of contracted players for 2009-10 by fast bowler Shaun Tait. Cricket Australia operations manager Michael Brown said: "We've given him our full support if he chooses to play state cricket. "Hopefully, he's not lost to the Australian game." Symonds was sent home two days before Australia began its brief Twenty20 World Cup campaign which ended at the group stage following losses to West Indies and Sri Lanka. Reports said Symonds went to a bar, without telling team management, to celebrate Queensland's win in the rugby league State-of-Origin series opener. It was the latest in a series of disciplinary incidents involving Symonds over the past few months. Last September, he was ordered to undergo counseling after being expelled from the squad for going fishing instead of attending a team meeting ahead of a limited-overs series against Bangladesh. Two months later, he had to issue an apology after he went out drinking with members of the Australian rugby league side and was involved in an incident at a Brisbane hotel, although he was later cleared of any wrongdoing. In January this year he was fined by Cricket Australia for a remark he made about New Zealand's Brendon McCullum during a radio interview. Symonds is currently thinking over his future but has asked his state side, Queensland, not to include him in their list of contracted players for the next domestic season. "Andrew has been up front with us and made a very selfless gesture by advising us not to contract him. "He knows the door is open here and we look forward to catching up with him when he's ready to have chat about what his plans might be," said Queensland chief executive Graham Dixon. "As we have said all along, our main concern is for Andrew Symonds the person. Cricket issues should take a back seat and we will let Andrew have the time and space to work out what he wants to do with his life from here." Brown, meanwhile, said he hoped Symonds would not turn his back on Australian cricket. "He's a world-class player and if Andrew would like to play, Australian cricket would like to see him back playing for Queensland," he added. Symonds does still have another year left on a lucrative contract with the Indian Premier League, having recently helped Deccan Chargers win the IPL title.